Staying with a soft theme of White European Marques brings us to today’s OTS sent in by Dave C in Winnipeg Canada. This is his Mercier Special Tour de France which, surprisingly enough, is not the first of its kind in the OTSG. 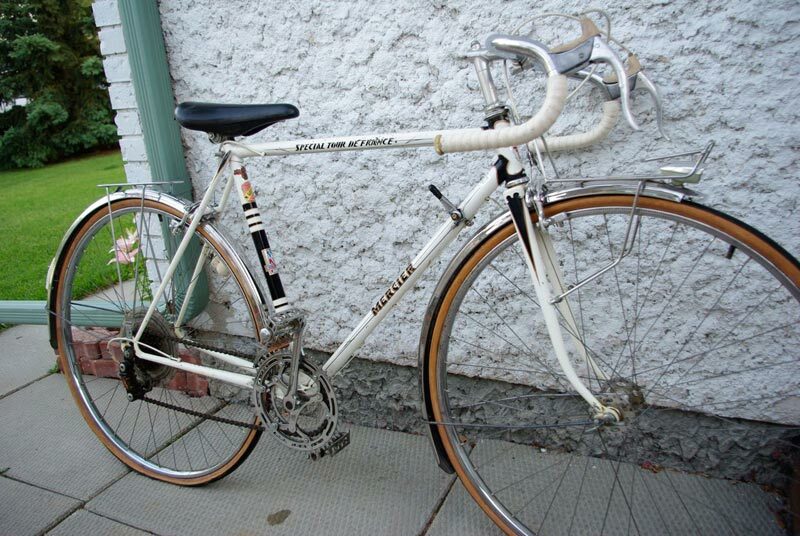 This is actually a Mercier 15 speed bike. I have had trouble finding out any information about this particular model. It has the standard Mercier features, Mafac racer brakes, Simplex derailleur, Hutchison tires, etc. but was outfitted as a light touring bike. It has full chrome fenders, luggage racks , and a generator for powering a headlight and tail light. The 15 speeds also seems to make it a little more unique. 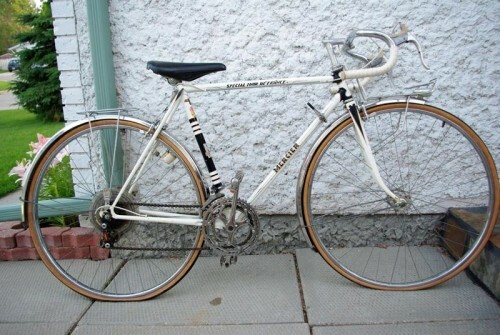 This bike was purchased in the late 70’s as a replacement for the same model that was stolen from my garage. The original was from the early 70’s and had the same features except for a leather seat instead of vinyl. I have no idea of the current value of the bike and whether a collector would be interested. It has been stored in my garage for the last 30 years but not been ridden since the early 80’s. HHhhmmmm, I’m sure I can’t afford it, but I have an old Italian road bike circa 1983, a “Zullo”, so I guess I’d have to say I’m a fan. What size is the frame? and, ah, what might you want for the bike???? looking at the head tube, is that about 54 cm frame? bike just the same.I do have a Winnipeg Jets jersey with the “Goals for Kids” patch. If you were a little closer I would offer you the jersey and some cash for the bike. In a heart beat! The frame actually is between 52-53 cm. I’m 6 ‘ and the bike was fine for me to ride. I apologize for the flat tires, I haven’t decided if I’m going to get the bike ridable or not. There have been other Merciers posted on OTSG but I think this is the first 15 speed and the first one with fenders and built in lights. When I purchased it, it was slightly more expensive than the 10 speed Peugeots my friends had.